As detailed within the fine print buried at the bottom of Apple’s iOS6 information page, iPhone 4 and iPhone 3GS owners won’t be able to take advantage of turn-by-turn navigation when the new version of the operating system is released later this year. iPhone 4 owners that want turn-by-turn directions will have to upgrade to the iPhone 4S or the new iPhone that will likely be released during Fall 2012. While Apple doesn’t specifically indicate the reason behind withholding the turn-by-turn direction feature from iPhone 4 owners, it’s possible that the lack of a dual-core A5 chip in the iPhone 4 is the contributing factor behind the decision. Owners of the iPhone 4 will have to rely on third-party applications like CoPilot Live, TomTom and MobileNavigator in order to use turn-by-turn directions on the mobile device. In addition to holding back turn-by-turn directions, iPhone 4 and iPhone 3GS owners won’t have access to the 3D Flyover feature demonstrated at the recent WWDC keynote address. Flyover simulates the point-of-view of a bird that’s sailing over a landscape. Using aerial photographs, Apple has stitched together expansive views of major cities around the United States. 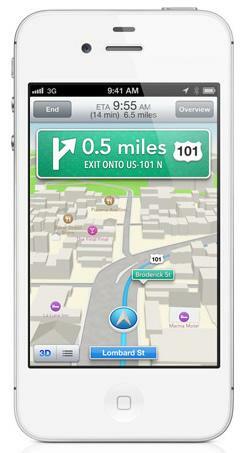 Beyond the navigation apps, iPhone 4 and iPhone 3GS owners won’t be getting access to Siri when the update launches. Siri also won’t be making an appearance on the iPad 2 either. Specific to the iPhone 3GS, owners of that smartphone won’t be getting access to the shared photo streams, the VIP features within the mailbox application and FaceTime over a 3G cellular data connection. There’s also a possibility that the 3GS performance will suffer with the launch of iOS6, a problem that 3GS owners noticed when iOS4 launched for all Apple devices. Of course, iPhone 4 and iPhone 3GS owners that choose to jailbreak their smartphone may be able to enable some of these new iOS6 features after the official launch of the new software.